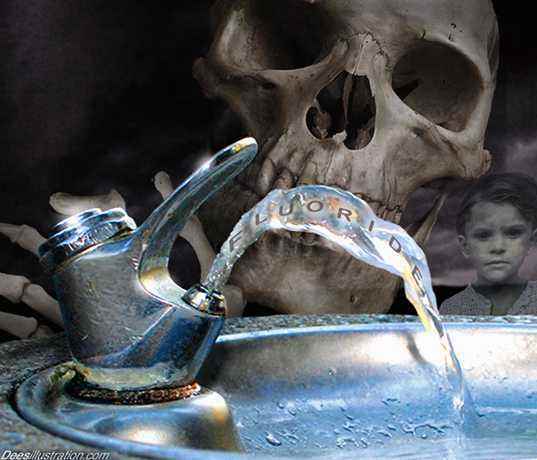 Fluoride—Good for the Teeth but Bad for the Kidneys? One of the greatest public health successes of the 20th century, according to the Centers for Disease Control and Prevention, is the fluoridation of most public water systems in an effort to control tooth decay. But recent research is showing that flouride has several significant downsides—including harming the creation of tooth enamel. According to an article published in the Wall Street Journal about “the fluoride wars,” the U.S. has one of the highest rates of dental fluorosis among all industrialized nations. Fluorosis is the general term for chronic fluoride poisoning. More specifically, it is defined as the underdevelopment of tooth enamel in children, and is caused by ingesting water that is too high in fluoride. The CDC in 2005 reported dental fluorosis at a rate of 32% among American children. University studies published in the September 2008 issue ofEnvironmental Health Perspectives confirmed that fluoride interferes with the process of making tooth enamel. This is cause for great concern since the country already has a dental enamel crisis: 95% percent of Americans consume soda and/or energy drinks, and the acidic pH of these beverages demineralizes tooth enamel. About fifteen years ago there was a surge of interest in the ability of fluoride to harden bones in people at risk of osteoporosis or bone thinning. This use of fluoride was quickly dropped when it became clear that fluoride hardened the bone but in a manner that made it more brittle and therefore more susceptible to breakage. A 2006 report from the National Research Council indicated that kidney patients are even more susceptible to the damaging effects of fluoride on teeth and bones, prompting the National Kidney Foundation to drop its support of water fluoridation. Unfortunately, their recommendation to monitor fluoride intake in children and patients with kidney disease is problematic because FDA food labels do not quantify fluoride content. Recent research published in JAMA calls for the CDC to recognize chronic kidney disease as a major public health concern in the U.S. Moreover, according to Dr. Vyvyan Howard, a prominent fetal toxicologist, eighteen studies done in several countries show that children’s IQs tend to be lower in natural water fluoride areas. Dr. Howard says that fluoride affects the thyroid hormone, which has an impact on intelligence, and fluoride is a known neurotoxicant. And the late John Yiamouyiannis, Ph.D., the world’s leading authority on the biological effects of fluoride, documented the damaging effects of fluoride in his book Fluoride—the Aging Factor, the definitive work on the topic. Concerned by these reports, parents note that Finland and other countries are treating the problem of tooth decay with a more helpful approach. During World War II when sugar supplies were interrupted, the Finns turned to sweetener derived from birch trees. This natural sugar was rich in xylitol, now confirmed in scientific studies to reduce the incidence of tooth decay.Dental wipes can easily be used to administer xylitol to children and infants. There is no one-size-fits-all medicine or public health measure. If you believe that fluoride will benefit your child’s risk of dental cavities, then administer fluoride in a measured quantity to your child under the direction of a knowledgeable practitioner. Fluoride in our water supply, toothpastes, mouthwashes, and bottled water (among other sources) is not recommended, since the effects of fluoride are cumulative.The larger issue is one of individualized medicine; AAHF is working to protect the consumer’s right to choose, and the practitioner’s right to practice.